The official game of the 2009 FIA FORMULA ONE WORLD CHAMPIONSHIP, F1 2009TM features all of the drivers, teams, and circuits from the 2009 season, including the debut of Singapore and Abu Dhabi. The first proper Formula 1 game released to the public was Geoff Crammond's Formula One GrandPrix back in 1991. Watching a video of it on youtube brings back some happy memories, it also shows how despite being cutting edge at the time, the graphics and sound we're very minimalist to say the least. However that didn't really matter, because your imagination could superimpose what you'd seen on TV, along with Murray Walker's voice and all of a sudden you'd become a Formula 1 driver with nothing more than a Commodore Amiga and a Cycling Proficiency Badge. One thing Geoff Crammond's game taught us about Formula 1, is the only thing that really matters in a single player game is time, lap time to be specific. You might be thinking, how can lap time be more important than winning a race or championship? The short answer is, would you rather come first in a marathon or be that fastest person over 100 meters. Just having the knowledge you can drive round a track faster than anyone else is a special feeling. Sebestain Vettel takes particular pride in trying to post the fastest lap during a race, and despite not winning the world championship in 2009, he did win the DHL Fastest Lap Trophy for the season. Formula One is all about trying to improve lap times and the teams can easily spend half a million pounds just to get an extra one-tenth of a second lap improvement. In order for a driver to know where they can improve, each track is broken down in to three sectors. Knowing the time you do in each sector is absolutely critical, hence all the F1 timing applications display the sector times for the fans to digest. Given that Formula One is all about time, how did the developers on Wii F1 2009 commit a major crime and not let you see the sector times until you've finished the lap and returned to the garage! The irony is, the game does display the time as you hit each sector but it's cumulative so you don't know where you've gained or lost time (apart from the first sector). So it's probably only one line of code away from being fixed. The missing sector times seem to set the theme for the whole game. The theme being that it was released about a month too early and was never tested by someone whose actually interested in motor-sports. Given that Formula One is watched by half a billion people on TV, and there's 70 million Wii's out there, it makes you wonder how the developer/publisher managed to drop the ball on this one. Another fine example of mess ups is the lack of being able to post your fastest lap on to a leader board on the internet. You can understand the lack of a online multilayer version, but no leader board is a massive mistake, to the point where it makes the whole car adjustments a waste of time as soon as can beat the AI cars. A few fans of the game have resorted to filming their fastest laps and uploaded to youtube. What's worse, there's a lot of unnecessary features in the game like an email client where you can get messages during the career mode. Even that has some bugs in it, for example if you've won the season before it finishes, you'll still get emails reporting the Jenson Button is going to beat you to it. The period of time it displays the cumulative sector time, during a lap is far too short, it'll pop up, then before you can take your eyes off the track its disappeared. The game does not record your fastest lap on a circuit. When doing time trials you race against a ghost car which is your fastest lap of the session. Unfortunately every time you start a new session the ghost car is reset to a generic slow lap. It make it's hard to improve because everytime you return to the game you've got no sector times, and no car to act as benchmark. Quick start mode, doesn't remember remember the last selected circuit or driver. Training mode where you're talked around each corner doesn't seem to work well and wouldn't be missed if it was left out. The penalty system is very buggy, there's situations where a stop and go penalty can be given just for a rear tire touching the a kerb on the exit of a corner. Frame rate drops during a race might have been avoided with a bit of optimisation of either the engine or the track design. Instead of bundling the game with a plastic f1 style wheel, they should have an optional bundle which included Wii classic controller. Without using the analogue controls on the classic controller the game isn't worth playing. You have to press a button before going to the first menu screen. Why? Time trial mode is excellent, partly because the frame rate is consistently high (due to the lack of other cars). Despite what some reviews have stated, the sound holds up well compared to what you hear at an actual circuit. The responsiveness of the handling in partnership with the physics engine does give you a good feel for the car. The circuit surroundings are sparse but the tracks feel detailed with the car picking up on all the bumps and contours. Good driving style is rewarded with fast lap times. If you hit the apexes, and ensure you focus on corner exit speed rather than entry speed you're going to post some fast times. The engine behind the game is apparently based on Codemasters Ego engine. Currently the closet you can get to driving a Formula One car, is using one of the racing teams simulators. A lot of the teams use a simulator called rFactor Pro . The standard PC rFactor simulator has a good pedigree in racing games (and low machine requirement), there's even a mirror Formula 1 championship held on line. You've got to ask the question, what would the game have been like if the engine behind rFactor had been ported and used on the Wii instead the Codemasters engine. My gut feeling is it would have had been a 9/10 game (with multi-player) and potentially led to a number of F1 fans acquiring a Wii just to play it. Overall though, F1 2009 despite the niggles, is a good game and definitely worth adding to the collection if you're a motor-sport fan. Driving around Spa Franco-champs on time trial mode with all driving aids turned off and the Wii Classic controller in hand, is high addictive (current fastest lap is 1.39.200). If they were to make a 2010 version with some of the bugs sorted out, it would fannnnntastic. 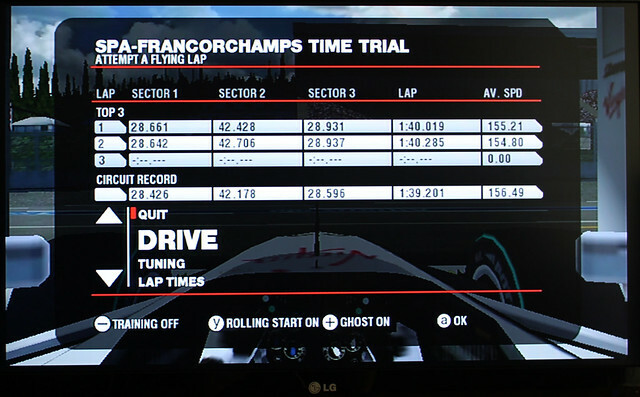 Just found another slight bug while taking some screen shots :-) The fastest lap time around Spa according to the sector times is 1.39.201, but on the Lap Records menu it's 1.39.200, bizzare.